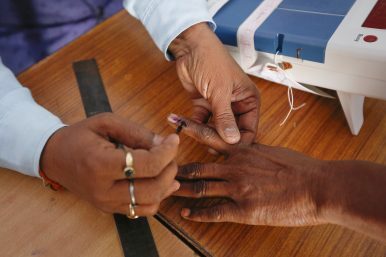 A polling officer puts indelible ink on the finger of a voter at a polling station in village Padampura, near Ajmer, India, Friday, Dec. 7, 2018. Until December 11, analysts of Indian politics and media pundits had it easy. A majority of India’s states – 20 of 29 – were colored saffron on the federal republic’s political map. The color often symbolizes the Bharatiya Janata Party (BJP), the nationally dominant Hindu nationalist party. The BJP had not only won most of the state assembly elections in the previous years, but also triumphed in the general elections of 2014. Narendra Modi, earlier the BJP’s highly controversial chief minister in the state of Gujarat, took the position at the helm of the central government as prime minister, becoming the BJP’s unquestioned leader and the country’s most popular politician. During this time, commentators did not need to hedge: words like “dominance” were fully justified. Now the colors are changing and the picture becomes a little bit more complex. It is possible that the green color that often denotes the Indian National Congress, the BJP’s main rival, will now spread across central India, covering the states of Madhya Pradesh and Chhattisgarh. It may also overpower Delhi’s southwestern flank, the sprawling state of Rajasthan. On December 11, votes in five recent state assembly elections were counted; it seems the BJP did not win a single one of these elections, and lost its rule in the three above-mentioned states (the two other states where elections were held were Telangana and Mizoram). In India, state elections and byelections, especially in bigger states, are often treated as omens for the general elections. And these are indeed coming in about six months (in April-May 2019). So has the “Modi wave” receded and does the opposition look poised to capture the throne? I would say the wave may be at a lower tide, at the moment but the BJP is far from being routed. Why? First, it was a close contest. As the dust is settling on the battlefield and the final votes are being counted, in Madhya Pradesh the Congress is ahead of the BJP by only five seats (114 to 109). In Rajasthan, the Congress may have just enough seats to gain power or be one seat short of the majority. In both of the states the difference in vote share is minuscule. Chhattisgarh witnessed a much clearer victory by the Congress in terms of both seats and the vote share, but it is Madhya Pradesh and Rajasthan that matter much more, being two of the 10 most populous Indian states. Both Telangana and small Mizoram witnessed victories by regional parties. These parties may always change their alliance affiliations – to the BJP, the Congress, or a third front – depending on the situation. Second, the BJP faced accumulated anti-incumbency sentiment. It has been ruling Madhya Pradesh and Chhattisgarh for the past 15 years (three tenures), and Rajasthan for one full tenure. In the first two states, a whole generation has nearly grown up watching the face of the same state chief minister on the posters – but without seeing too much job growth. Given that level of anti-incumbency, the Congress should not be satisfied with its result, especially in Madhya Pradesh, but also in Rajasthan. Third, the national elections follow their own rules and these would now work for BJP’s benefit. The Hindu nationalist party is still the most popular one. In national elections the constituencies are delimited in different ways (they are much larger, of course), and many voters apparently choose differently on the state and the national level (for example, because they know that a regional party will not succeed on the national level). Moreover, in India’s first-past-the-post system, the rivals of the most popular party/coalition must rally, otherwise their split electorates may cost them victory. A grand coalition against the BJP, despite a lot of rhetoric about it, has not been born till now. It is still possible to build it in the few coming months, however. Fourth, the BJP is still stronger than the Congress. Having ruled most of India, while until now the Congress has been ruling just one important state, the Hindu nationalist party had ample time to fill up its coffers. The Congress also lacks leadership that would match Modi’s charisma or the strategizing skills of BJP President Amit Shah. The Congress may have won now, but the list of its defeats in the past few years is shameful for India’s oldest party. In a way, maybe apart from Chhattisgarh, it was the BJP that lost and not the Congress that won. While some commentators predict the party’s revival after these polls, I do not see the current, inept avatar of the Congress fit to tackle the BJP. At the same time it still occupies the center-to-left position as Hindu nationalist BJP’s main rival and there is no time for an alternative party to grow enough to wrest that position from the Congress by mid-2019. All the same, the BJP should be worried. Five years ago the nationalist party sold its narrative by stamping each issue with Modi’s face and filling it with the word vikas (development). Now this brochure does not sell that much. Modi’s government has not provided as much growth and jobs as expected. It did not root out most of the corruption; its “Make in India” campaign turned out to be more rhetoric than action; its demonetization proved to be a blunder; and the government’s wrestling with its own Reserve Bank of India raised economists’ eyebrows. The BJP government in Madhya Pradesh, for instance, was seen as generous for the farmers a few years back but eventually not generous enough. The situation of many farmers across India remains very difficult; a part of BJP’s champion-of-the-poor image is lost. The party also apparently convinced many middle-positioned voters back in 2013 that it would only focus on the economy, putting ideology in the back pocket. Five years later, it is obvious this did not happen. That was visible not only in appointing Hindu holymen as ministers in Madhya Pradesh or filling school textbooks in Rajasthan with ideologized teachings but also many other, more brutal incidents across the country. Last but not least, the BJP was always more popular in Hindi-speaking regions and more generally in north India than elsewhere. Yet, it is in the broadly understood Hindi belt — to which Rajasthan, Madhya Pradesh, and Chhattisgarh belong — that it has now suffered a setback. So if you should bet… don’t. Do not waste money on gambling. But Modi and the BJP seem to still have the edge. The BJP is still more powerful, affluent, and better managed than its key rivals, and with Modi’s charisma, the party’s industrialist allies, and its grasp of the media, it still has time to reassert itself and rewrite the rhetoric for the national elections. The Alliance of Indian Kings: Can a Coalition Defeat Modi’s BJP in the 2019 Elections?Indian Elections 2019: Do Narendra Modi and the BJP Deserve a Second Term?India’s Ruling BJP Releases Manifesto: Document Emphasizes Continuity in Foreign Policy5 Kings and 1 Queen: Who Are the Most Powerful State Leaders in India?The Temple Guardians: Is India’ Ruling BJP Becoming More Conservative?